Embark on a journey with us through the eventful history of the company. Our corporate development is characterized by progressive formwork and scaffolding products as well as fascinating buildings. PERI is founded and the first production hall is built on the 6,000 m² company premises in Weissenhorn. Artur Schwörer founds the company PERI together with his wife Christl. The company's aim is the rationalization of building with concrete. Construction work is meant to become easier, faster and safer. The first production hall is built in Weissenhorn. PERI is a Greek prefix and means "around". The formwork surrounds the concrete - the scaffold surrounds the building. The first production hall is built on the 6,000 m² company premises in Weissenhorn. The first PERI team with Karl Müller, Josef Schwatzer, Josef Madel, Nikolaus Bechthold, Günther Bohatsch, Alfred Fuchs and Bruno Konrad (from the left). The first girder is produced, the PERI T 70 is born. T stands for the German word "Träger" (girder) - 70 for the chord thickness in millimeters. The first order was for 80 girders with a length of 3.05 m. The girders were impregnated by hand with a sponge over a plastic tub and directly loaded on the waiting truck. The annual output was about 50,000 linear meters. The first major order, the first bauma and the first handbook. The world´s biggest twin vertical ship lift close to Lüneburg in Germany connects the Mittelland Canal and the River Elbe, bridging a height difference of 38 m. It is the first major contract for PERI. 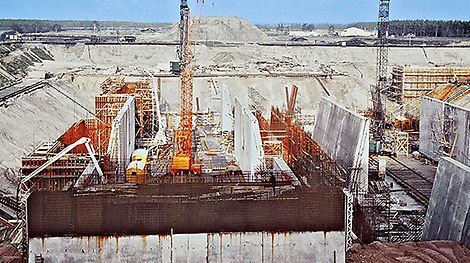 Extra-long T 70 formwork girders are used for the construction. For the first time, PERI takes part in bauma in Munich and presents the T 70 girder and the Culvert Frame Formwork. The first issue is distributed at the first bauma in 1971 and it is a little sensation: A comprehensive volume for the formwork market with color photos, tables and work instructions. The first branch offices and subsidiaries are established. PERI expands within Germany. The first subsidiaries are founded in Hamburg and Stuttgart in 1972. In 1973, the world's first climbing scaffold increases the safety and work speed at the jobsite. The bold design rationalizes the construction of high-rises enormously because formwork and scaffolding can be moved in one crane lift. The first subsidiaries abroad are established in Switzerland and France in 1974. The plant in Weissenhorn is continuously enlarged in order to meet the increasing demand. The "PERI Aktuell" customer magazine is published and the plant in Weissenhorn grows. In February 1976, the first issue of the "PERI Aktuell" customer magazine is published. 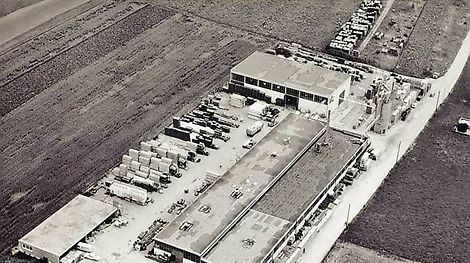 In 1976, the PERI plant consists of four production halls, large storage areas and an outdoor product exhibition. PERI buys the first EDP system the same year. 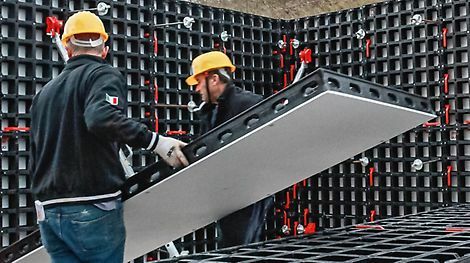 The large order for Germany's largest nuclear power plant in Gundremmingen leads to the foundation of the formwork assembly in Weissenhorn. PERI gets a new company logo, and the first subsidiary outside Europe is founded. The design engineers working in the technical office in Weissenhorn. After ten years, the black and yellow company logo is replaced by a new one in 1979. For the first time, the logo also shows the color red. Construction work in Weissenhorn goes on, the sixth hall and the main office building are erected. In 1980, PERI sets another milestone with the MODUL Slab Formwork made of aluminum. The first subsidiary outside Europe is founded in the United States of America. 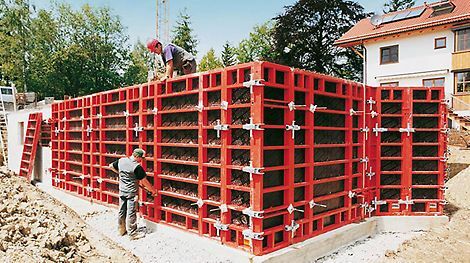 The TRIO panel formwork becomes the leading panel formwork in Europe. 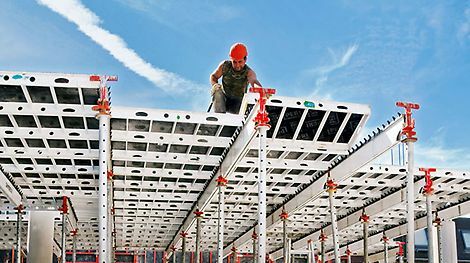 As a further development of the T 70 V with a height of 36 cm, the new wooden lattice girder GT 24 offers more flexibility at the jobsite maintaining the same dimensional stability with a 12-cm lower height. The plant grows extremely fast. Large production halls and outdoor storage areas are part of the company premises. 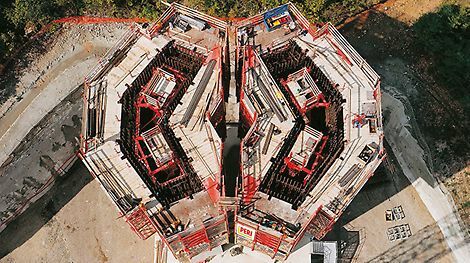 PERI causes a sensation with the RAPID Column Formwork and the innovative Circular Formwork with articulated walers. "Schalung und Gerüste" (formwork and scaffolding) becomes part of the PERI logo from 1985-1989. 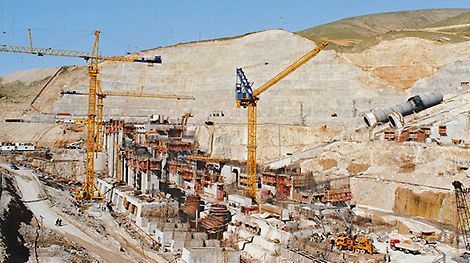 The movable SKS Single-Sided Climbing Formwork begins its international success story with the construction of the world's third largest dam in Turkey. The universal TRIO Wall Formwork system is launched and convinces with few different individual components. It stands for fast forming and becomes the market-leading system within a few years. PERI invests DEM 14 million in Weissenhorn and opens the first production facility outside Germany in Turkey. A milestone in self-climbing technology: PERI introduces the ACS. Climbing takes place with the hydraulic climbing mechanism without the use of a crane. Comfortable working platforms protect site personnel during all weathers. 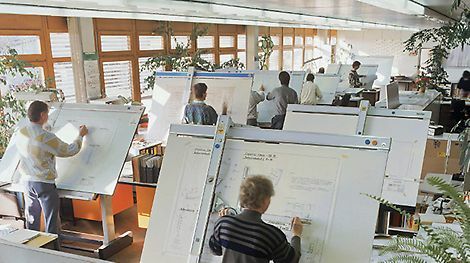 73 modern CAD work places replace the drawing boards in Weissenhorn. Production robots and PC-controlled warehouse technology are also acquired and the powder-coating system is commissioned. The PERI logo is adjusted: The words "Schalung und Gerüste" (formwork and scaffolding) become more pronounced against the yellow background and they also remind of the first black-yellow PERI logo. Innovations made of aluminum make life at the jobsite easier, and PERI is 25 years young. PERI introduces the lightweight SKYDECK Slab Formwork at bauma 1992. It is designed with a drophead system and allows for early striking so that the on-site material requirements can be reduced. 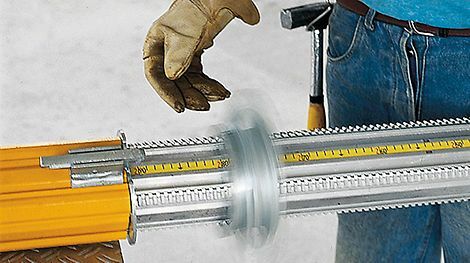 Low weight, high load-bearing capacity, an integrated measuring tape and the self-cleaning thread are the basis for the rapid success of MULTIPROP around the world. The company premises in Weissenhorn are enlarged by 40,000 m² to 150,000 m². PERI has 13 branch offices in Germany, 22 subsidiaries and supports more than 4,000 customers around the world. The product portfolio includes more than 2,000 products. In Weissenhorn, the new exhibition hall for product demonstrations is finished. The ELPOS computer program sets new standards in work preparation for the planning and dispatching of PERI standard systems. PERI has been on the internet since 1997 and successfully starts with the scaffolding business. The new solution for columns means an enormous reduction of crane time at the jobsite because the complete column including push-pull props and concreting platform can be moved in one lift. The ACS Self-Climbing System ensures smooth construction progress during the building of the then highest building in the world with 452 m in Kuala Lumpur, Malaysia. PERI starts its activities in the scaffolding market with the development of the PERI UP Scaffolding System. The PERI UP T 72 facade scaffold with T-frames and guardrail in advance is safe and efficient. With the Quadragon, an ultra-modern office building for the PERI staff in Weissenhorn is realized. Many terrific buildings are constructed with PERI knowhow and material from Weissenhorn. The 2.5 km long cable-stayed bridge in France is constructed using special steel formwork, which rises upwards cycle-by-cycle with the help of the ACS Self-Climbing System. At that time it is the longest cable-stayed bridge in the world. Due to its torsion-like architecture, the 190-m high office and residential complex Turning Torso in Sweden requires a particularly efficient formwork concept with ACS climbing units. 20,000 linear meters of girders are produced per day with the fully automatic production plant. The VARIOKIT engineering construction kit and the MAXIMO panel formwork cause a sensation in the industry. The pilot project for serially manufactured 3-D formwork units for the construction of the Mercedes Benz Museum in Stuttgart in Germany sets new standards in formwork technology. 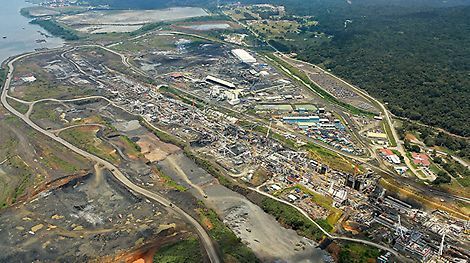 PERI enlarges its production space by 80% and doubles its logistics and material planning areas. All in all, PERI invests about EUR 80 million in Weissenhorn. The system, which can be supplied optionally with or without hydraulic technology, can be perfectly adjusted to jobsite-specific requirements. PERI presents for the first time at bauma the MAXIMO Panel Formwork with single-sided MX tie technology. In the US federal state of Louisiana, three giant liquefied natural gas tanks are built with PERI know-how. Each structure has a diameter of 80 m and wall heights of 44 m.
The founder of the company, Artur Schwörer (deceased in 2009), hands over the management of the company to his two sons Alexander and Christian in 2007. 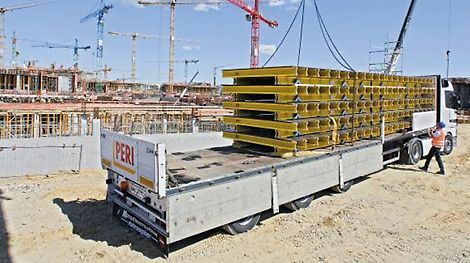 For load combinations in tunnel, bridge and building construction, PERI provides for the first time a construction kit consisting of standardized, rentable system components and connecting elements. While PERI becomes active on the industrial scaffold market, the whole company mourns the death of the company’s founder, Artur Schwörer. With a length of 1.455 km and the impressive width of 60 m, the Sheikh Khalifa Bridge connects the mainland of Abu Dhabi in the United Arab Emirates with Saadiyat Island. In 2008, Artur Schwörer is awarded the "Bayerische Verdienstorden" (Bavarian Order of Merit) for his lifetime achievements, the highest award to be awarded in the German federal state of Bavaria. 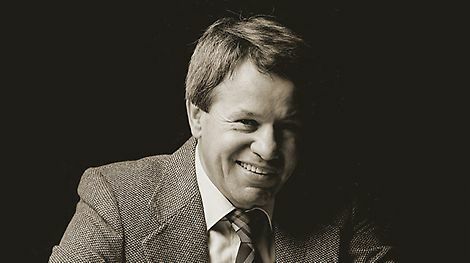 In 2009, Artur Schwörer dies at the age of 76. With the flexible modular-type PERI UP Flex Scaffold, PERI starts its activities for industrial scaffold applications. PERI supports the construction site team with different types of system formwork, among them huge amounts of slab, wall and column formwork. PERI's service also includes the planning and delivery of accordingly adjusted shoring. PERI develops new products for new markets. 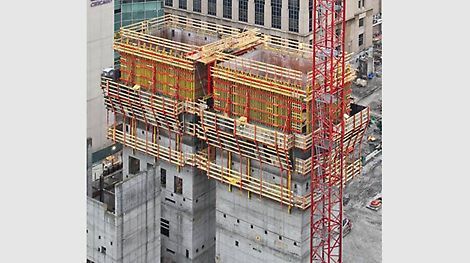 The particularly lightweight and easy-to-handle wall formwork system is ideal in places where crane capacities are limited or not available at all. PERI introduces the UNO for the first time at bauma 2010. Walls, columns, slabs, beams and stairways are shuttered and concreted simultaneously using the monolithic construction method. UNO is the fast and cost-effective solution for forming residential buildings featuring frequently repetitive floor plans. bauma has turned into the world-leading trade fair for the construction equipment and machinery industry. PERI's impressive exhibition hall has a floor space of more than 4,000 m². PERI buys the South African trade partner Wiehahn and successfully integrates it into the company group. The external growth strategy in South Africa is the first of its kind in the company's history. The new construction of the giant lock facilities on the Atlantic and Pacific coasts is the largest single order in the company's history. The use of big SCS climbing units renders the fabrication of the massive lock parts cost-effective. Digital solutions made by PERI complete the existing product and services portfolio. Up-to-date, transparent and available 24/7! PERI is the first manufacturer of formwork and scaffolding to offer its customers direct access to necessary information. All project documents can be called up online at any time. PERI introduces new digital developments at bauma 2013. The PERI handbook has its premiere as an application for mobile devices. The company also presents applications to its visitors at the fair which can determine the concreting speed as well as a smartphone and tablet configurator for the MULTIFLEX Slab Formwork. PERI has developed the lightweight LPS Screen protection panel system for buildings with open facades as an alternative for complete enclosures. On the one hand, the established and the recently created departments are brought closer to one another and at the same time space for future requirements is created with the new building. PERI grows in all areas. More than 60 subsidiaries now belong to the PERI Group. Under the names of CENTRIO and CENTRIO CLM, PERI offers sustainable IT solutions for the digitalization of construction processes. The ultra-modern production site for VT 20 girders starts operation in Noginsk in Russia at the end of September 2015, and thus leads to a further increase of the production capacity. 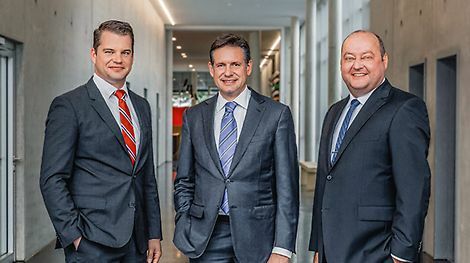 The competitor Schaltec becomes part of the PERI Group. This enlarges PERI's portfolio by the adequate services of refurbishment and trade with used goods. The unique shape of the reinforced concrete pylons and the complexity of the mounted parts for the construction of the third bridge across the Bosporus in Istanbul, Turkey, have required a very flexible planning process – a complete solution from PERI with the ACS Self-Climbing Formwork. The DUO lightweight universal formwork is successfully launched on the market. 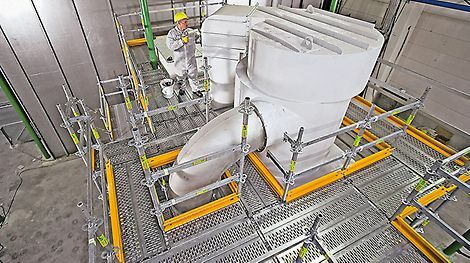 The new production site in Günzburg, Germany is the latest, ultra-modern head plant for scaffolding systems. At the same time, PERI enlarges its outdoor storage area with 20,000 m² at the company's headquarters in Weissenhorn. The PERI UP Easy Facade Scaffold is a “lightweight“ among the range of steel facade scaffolds. It is fast and safe to erect, provides extremely high safety standards for every application and proves itself with smart detail solutions. We present our worldwide novelty DUO for the first time at bauma 2016. DUO allows for flexible forming of walls, columns and slabs with only one system and without a crane.